Outdoor ceremony fee includes the set up and tear down of up to 200 light grey folding chairs, and a registry table with basic white linen. Guests will have access to the lower lobby and washroom facilities. When planning any event for outdoors, it is important to be prepared for the possibility of poor weather. 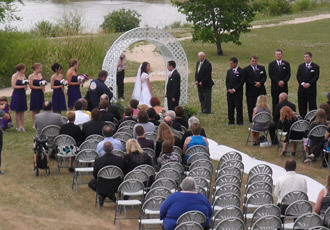 Access to meeting rooms and the main floor lobby is not included in the outdoor ceremony fee. Make sure to discuss rainy day options with Park staff.